PowerGuy® I1800 Portable Flat Pack Power with integrated Lithium Ion rechargeable battery! The PowerGuy® Flat-Pack Charger I-1800 i is the most flat rechargeable Portable Power pack for mobile phones, PDA`s, IPOD, MP3-Player or digital cameras. With the built in powerful 1800 mA Lithium-Ion battery it grants long power availibility. To create All-In-One solutions with the Flat Pack charger there are available several custom bags for PDA`s or even with IPOD to make it a power pack wearable at your belt. 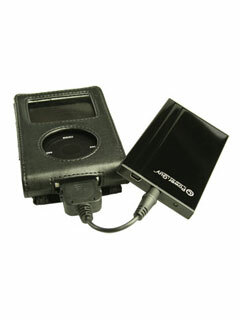 External Power Supply based on built-In Lithium Ion battery, suitable to charge and for continuous operation of mobile phones, MP3 Player, MDA/ PDA Portable Playstation or Digicams. In order to get it easy re-useable you can recharge it via the USB cable connected to your PC or optional USB power supply.